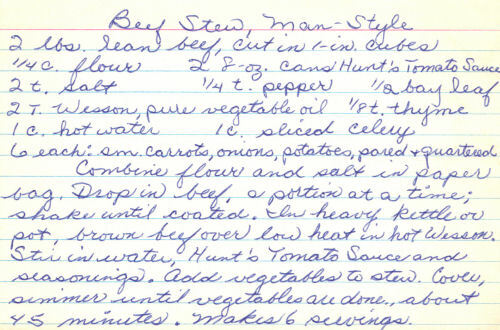 This handwritten recipe card was found in a large collection, date unknown. I’ve typed it out below along with a scanned copy. Combine flour and salt in paper bag. Drop in beef, a portion at a time; shake until coated. In heavy kettle or pot, brown beef over low heat in hot Wesson. Stir in water, Hunt’s Tomato Sauce and seasonings. Add vegetables to stew. Cover, simmer until vegetables are done, about 45 minutes. Makes 6 servings.